Heather ordered this cake for her daughter Justine and Justine’s friend Ane. Both girls share a birthday and were having a combined celebration for their 18th birthday before each of them head off to different parts of the world to explore their passions. Justine is leaving shortly for Alabama University to study and continue her swimming training there so I depicted Justine’s figurine wearing her full swimsuit, blue cap and goggles and included a red ‘Alabama’ towel and red lane marker for her new university. 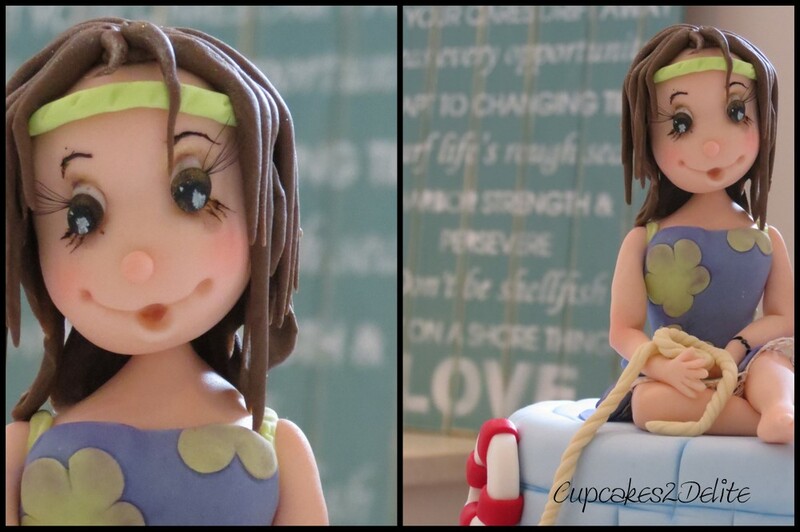 Ane’s figurine has dreadlocks and is wearing a hippie dress and headband and is holding her sugar paste rope ready for her yachting adventure this year. 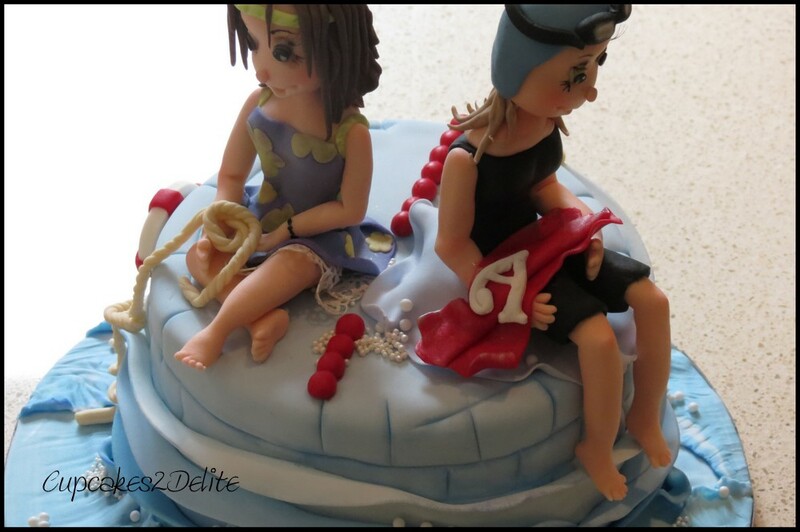 I placed both figurines on the one cake and added pool tiles for Justine at the top of the cake, life buoys, water edging and droplets for both the girls and waves kissing the edges of the cake from the board for Ane. Good luck to you both, Justine and Ane, the world is your oyster and I wish you all the best for the most awesome adventures this year! 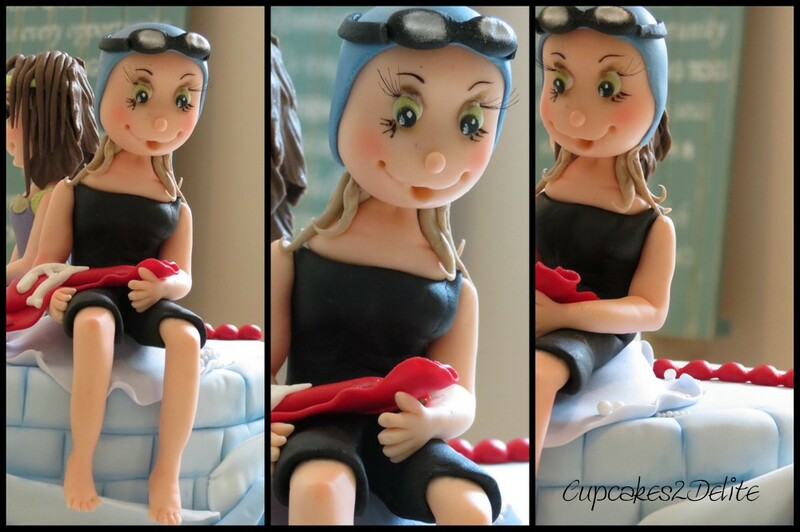 Lisa, your interpretation of your cakes is just soo amazing!! Your love and passion for what you do, shines through all your cakes!!! Wow thanks Jeanine, what kind words and I love that not only my clients are loving each cake but also all my followers. This inspires me to try even better with each cake I create!